This level has medium difficulty. 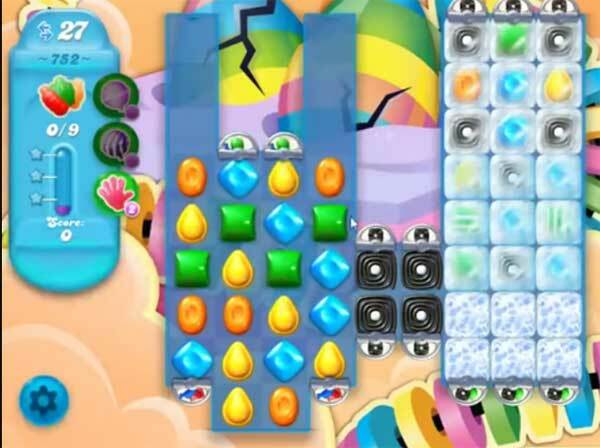 For this level try to play from left part of the board and make striped candy or fish as you get the chance. Combine them with colorbomb to break the blockers that are in right part of the board. Or play near to soda bottles to break them. The last bottle in this level did not appear until after my last move three times.. I will not pay to play on so I have not passed this level. Other players said the same thing..is king being greedy here too? Not an EASY level!! The fish never go to the bottom of the board to break the blockers that release the last bottles, and there are always blockers when you have a striped candy. Last bottle isn’t released until after your last move!! CHEAP SHOT!!! You all are right. I thought I was the only one that felt like this. I get 8 bottles every time and the last one spawn after my last move but I refuse to pay for extra moves. King is getting to damn greedy! ?